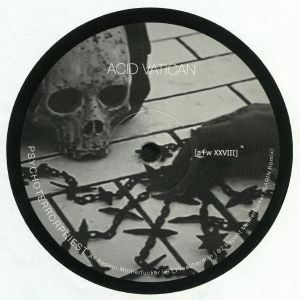 Acid Vatican is the new project of Antoni Maiovvi and Gianni Vercetti. The EP includes 2 original tracks and a remix by SΛRIN. The franchise goes one cut deeper as Parasols AKA Ali Renault and Antoni Maiovvi team up on this dark as hell during an eclipse set of grime soaked grease sleazers. Parasols throws forth two sharp as blades numbers with a guest appearance by the one and only Unit Black Flight with his first ever remix. Antoni Maiovvi closes things with something from the vaults, the 808 and sub bass sleekness of Shivers, remixed by Black Metal EBM overlord Equitant. Guaranteed nightclub nightmares as we put on the gloves one more time. Helena Hauff’s label is back, this time presenting a various artists 12″ that heralds the start of the No Return series. The release starts on a mystical bent with the Eastern-tinged death electro of “El Carmel”, sounding ripe for a Hague-friendly warm-up session. Neud Photo then take over with a dystopian trip through rich synth tones coloured in dark hues for the bleakest of robotic fantasies. 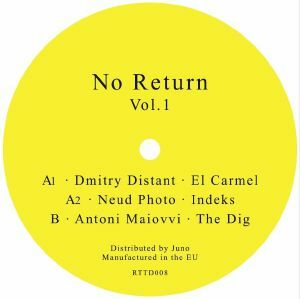 Antoni Maiovvi fills the B-side with the slow grinding bombast of “The Dig”, bleeding out a noirish take on coldwave for the darkest hearts to swoon to. 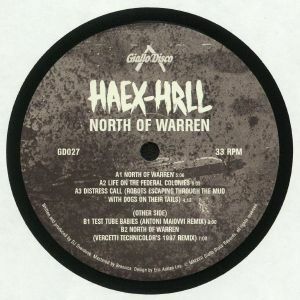 An addendum horrificata to the fantastic LP, Haex-Hrll AKA DJ Overdose returns from the nether regions of space with a louder dancefloor cut of sleeper hit ‘North Of Warren’ accompanied by witchy and dread filled extras. Remixes are provided by label heads Antoni Maiovvi who takes Test Tube Babies from the ‘Further From The Truth’ LP into tripped out waters and Vercetti Technicolor, who reimagines ‘North Of Warren’ for blood-soaked 90s Hollywood vampires.